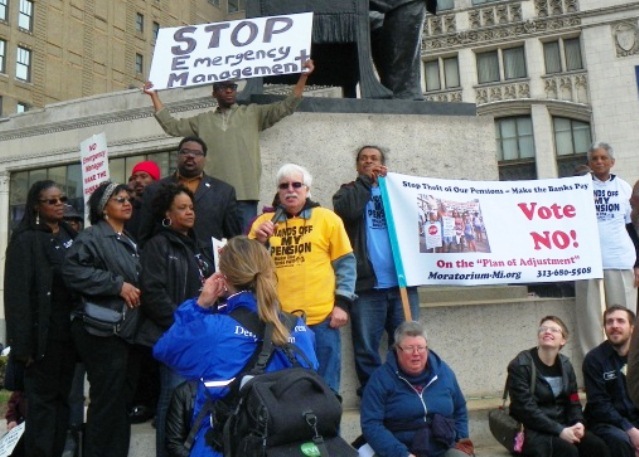 May 1, 2014 march against Detroit bankruptcy Plan of Adjustment. Mike Mulholland at informational picket at Huber facility in 2012. Not only does the Detroit bankruptcy plan affect retirees, it will end up seizing control of the Water Department. Hundreds have already been laid off and more are expected. The more city employees laid off, the greater the damage to city pension funds. Meanwhile, thousands of Detroit residents are having their water shut off without notice under EM Kevyn Orr and an essentially regionalized Water Board. 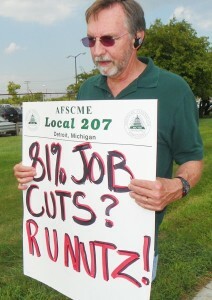 As a retiree from the City of Detroit, and acting president of AFSCME Local 207, I oppose the so-called Grand Bargain. Every dollar stolen from us will not be given to the people of Detroit, but merely help the greedy banks cut their losses. The banks manufactured the 2008 finance crisis and got bailed out while foreclosing on 100,000 families in Detroit alone. They should be jailed for racist predatory lending. Yet they expect us to bail them out with our modest pensions. This deal should be called Grand Larceny. This deal is not guaranteed. If the DIA or corporate foundations don’t make good on their pledges, if pension funding levela drop below 80% or if investment returns drop below 6.75%, our pensions will be cut again, without a vote. This is more than a 4.5% cut. It is more like 35-50%. Almost half of the General Fund retirees who planned for our retirement through the annuity savings plan will see a total pension cut of up 20%. That’s my situation. We are not even allowed to pay back what Kevyn Orr calls “excess interest” in a lump sum. The 20% cut will continue for my entire life. Since I opted for a reduced pension so that my wife could have financial security after I die, the 20% cut will continue for her entire life, long after the “debt” is repaid. The state’s $194 million contribution is a small portion of the revenue sharing they owe Detroit. Annuity savings participants are being extorted for at least $240 million, or more if we live too long. Dr. Martin Luther King, Jr. spent time in prison for leading massive civil rights movement, then was assassinated. Elimination of cost of living allowances will cost us and our beneficiaries 2.25% per year. Medical insurance cuts add up to an additional 30% loss, especially for those who are not old enough for Medicare. I am on Medicare, yet my monthly drug costs increased 400%. 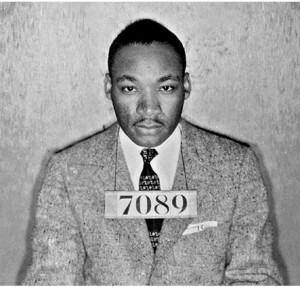 Pioneers of the union and the civil rights movements faced threats and repercussions. But they took the risk, and changed history. As always, the experts say that this is “the best we can get,” that the cuts are merciful, and that resistance is futile. The same arguments will be used to impose the “Detroit blueprint” on pensions throughout the nation. We are told that if we vote NO then even more punitive cuts will be imposed on us. But it has been our experience that whenever injustice is tolerated for the illusion of security, more demands soon follow. If we vote yes, we lose the right to sue. We should keep fighting and continue our legal appeals. However, as the US Supreme Court’s recent racist ruling against affirmative action shows, we cannot simply rely on the courts for justice. AFSCME Local 207’s Executive Board urges everyone to vote NO and to help build a mass movement of resistance. That is the only way we can secure our pensions and a brighter future for the people of Detroit and workers everywhere. May Day marchers blockade E. Jefferson Ave. at beginning of march.